One of the ACGT partners, CSIR, signed a Memorandum of Agreement (MoA) with UNISA, that officially sealed a partnership, for the commissioning of a 600 MHz Nuclear Magnetic Resonance (NMR) Instrument – the first of its kind, to be purchased and commissioned in the Gauteng region. 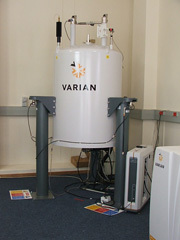 Generating a magnetic force 300,000 times stronger than the magnetic field of Earth, the NMR Instrument can be used to fully characterise the structures and molecular dynamics of isolated compounds of interest, particularly of those which cannot be crystallized. This is done by using one of two different probe systems, namely a dual broadband probe (for smaller molecules), or using the triple resonance probe for C, N and H analysis of larger protein molecules. Studies and increased understanding of protein- substrate interactions, in biological systems, will allow for the design of better and more effective drugs against a variety of disease-causing agents and will also be useful in nutrition research. While the instrument was purchased by UNISA, the CSIR, has provided a suitable Housing Facility, with subsequent maintenance costs being allocated, on a pro rata basis, between users. In accordance with the MOA, both CSIR and UNISA are contributing to Human capital development, by allowing UNISA post-graduate students, studying in the field of biotechnology, to perform practical work and receive training in CSIR laboratories. These students will be jointly supervised by UNISA and CSIR staff. Dr Martin Myer, Senior Lecturer and research coordinator in the Department of Life Sciences and Consumer Sciences at UNISA, is the Operations Manager of the Facility.